Honing her skills at her family’s successful Revelstoke hotel, The Regent, Jane has used those lessons to build her career and reputation as a strong Canadian businesswoman. Growing up in the hospitality business, Jane Hoffman learned just what it takes to provide exceptional client service and to give back to the community. At Jane Hoffman Group, we know that the right attitude and a well-founded work ethic ensure that a job is done well. Such spirit can thrive in every industry. That’s why we are champions for Canadian businesses that focus on client satisfaction, cohesive teamwork, and having women in leadership positions. We can learn a lot from the Regent in Revelstoke. Jane’s cousin, Maureen Beruschi, has been a staple at The Regent Hotel for 47 years, starting at the pub when she was 17. The family-run hotel is a constant and popular local employer, supported by a workforce of strong women (90% of the staff are female). At every level of service, the employees excel at organization, management, and interpersonal communication. Revelstoke may be a small town, but it harbours a lot of talent –and the Regent knows it. Many team members have spent their lives as part of the Regent family –some with almost 50 years of service! Long-term and new staff, alike, thrive on the interaction with guests from all walks of life, and on the opportunity to showcase the Revelstoke community to newcomers. They ensure that all operations run smoothly and that The Regent stays at the forefront of innovation in the hospitality industry. Inside this historic building, guests find a first-class boutique hotel: comfortable and modern rooms, excellent cuisine, dynamic and forward-thinking service, and unexpected surprises (like morning yoga sessions, adventure packages with local outfitting companies, and après-ski happy hour). The Beruschi family’s thoughtful and thorough management of this gem of a hotel has made The Regent an essential part of Revelstoke’s unique and irresistible appeal. Revelstoke is a tight-knit mountain community that showcases the very best of BC. Its glorious setting, enviable ski hill, and boundless outdoor activities attract residents and visitors all year round. Rich in history and culture, this charming town at the crux of the Monashee and Selkirk mountains has provided a welcome respite to travellers since the 1880s. For more than a century, those travellers have made themselves at home at The Regent Hotel. This family-owned-and-operated landmark property is one of Canada’s oldest. The structure itself is a testament to Revelstoke’s magnetism, filled with timeless photos, artifacts, and stories from across the globe. 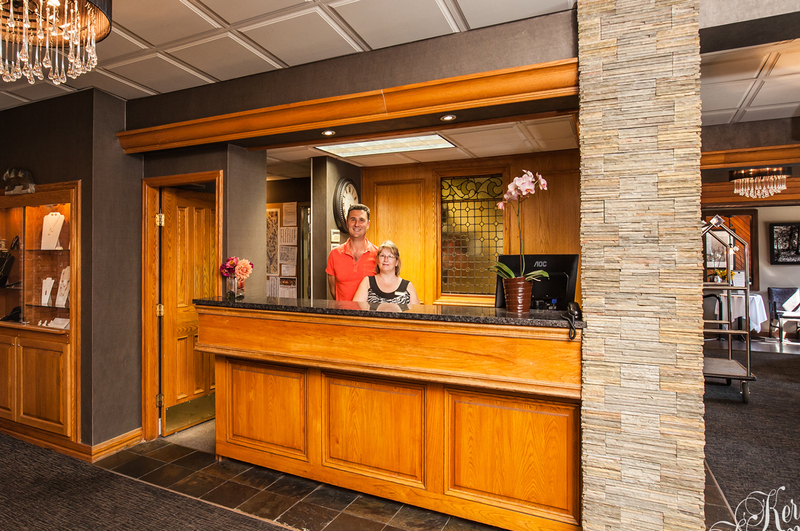 The Regent has played an integral role in the Revelstoke community since its origins as the (separate) Windsor and Selkirk Hotels at the turn of the last century. A rivalry eventually became a partnership, highlighting the idea that teamwork leads to success. Since 1945, The Regent has been a stalwart of the social and economic lives of Revelstoke citizens. The team at Jane Hoffman Group would like to congratulate The Regent Hotel on its dedication to its excellent staff and to the town of Revelstoke. Theirs is a great example of the successful community leadership that we all strive to achieve. 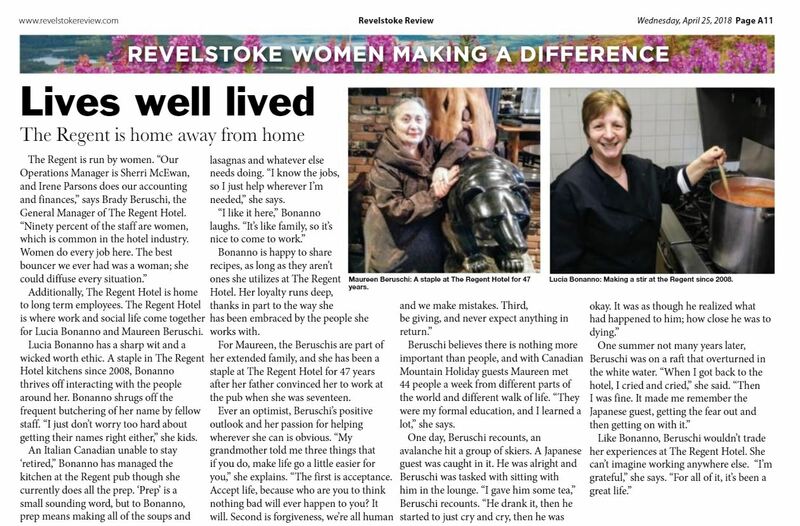 Interested in becoming part of the beautiful community of Revelstoke? Contact one of our team members, we’d be happy to tell you more!